As we get closer to the launch of our store we are excited to announce we finally have a name! As you saw in the last post, we finalised our idea around a store selling unique pieces of printed art targeted to the creative community, and the next step naturally was to decide on a name. We again went to our trusted paper and pen, and began pencilling down anything that came to our minds about art, paintings, printing etc. We must admit we came up with some pretty terrible names but eventually we started to jot down some names we thought could actually work. We decided to then put it down to a vote, and so it was confirmed that the name of our online store would be – Creative Lines. We thought this was fitting because as our store is selling creative pieces of art that we are going to draw in-house, its representative of what we do whilst still being slightly abstract. Now we had a name it was time to secure our domain. We like www.1and1.co.uk as we’ve found them reliable in the past and they’re easy to link to Shopify’s system. Visit www.1and1.co.uk and on the homepage you’re greeted with a box as pictured below to enter the domain name you’re after. Simply type in the domain you want and click ‘check’. If your lucky you’ll see a message as below saying your chosen domain is available. Great news! It’s common that your domain name may already be taken and if so just keep going back and typing in new names until you find one you like that’s available. 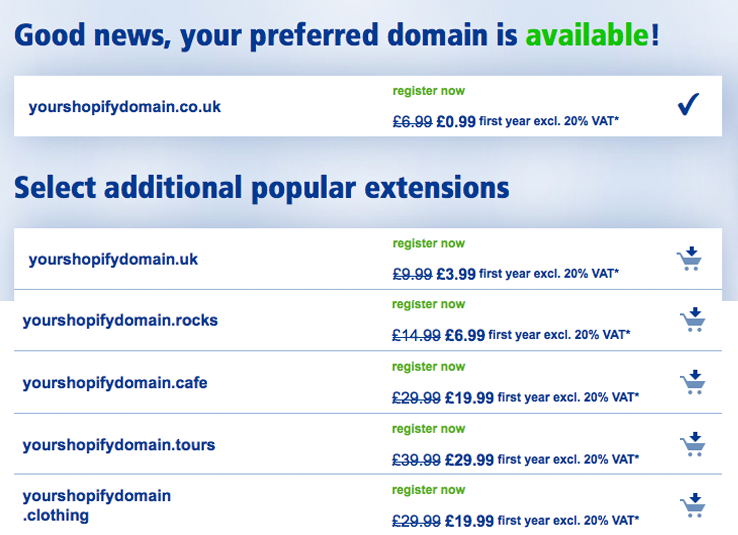 Remember there’s now a huge selection of domain extensions so you don’t have to just go for the common .co.uk and .com anymore. There’s now an extension for lots of industries from .cafe .clothing and so much more. As the .co.uk and the .com was taken for our name we decided to get creative and pick another extension. In the end we got it down to two. Creativelines.ink and creativelines.space. After some deliberation and comments that .ink sounded too tattoo studio like, we went for the .space extension. The next step is simply to click ‘continue with domain selection’ and proceed to the checkout. Note that along the way they will try and upsell you other website features but if your just after a domain name then you don’t have to add anything else to your cart. Congratulations you now have a domain name! So now we’ve purchased our domain name it’s now time to get some emails! Once you log in to your 1and1 dashboard you’ll see on the right hand side ‘create new email user’ as shown below. Click create and then you’re taken to screen to decide the type of mailbox you want. We went with the 1&1 Mail Basic, as it’s already included within our package. But there is a more advanced version with more space and features. Though to be honest the Basic is more than enough for most small businesses. Now type in the email you want whether it’s your name, info, sales or anything else. Give it a password and click save. Your emails now created and ready to use! Depending on your package you may also see options to add anti-spam or virus protection too and you can also set up ‘forwarding emails’ so that when you receive an email, it forwards the email onto another address of your choice, for example your personal email address. If you want to add your new email to your phone you can see how to here. So now we’ve confirmed our name, secured our domain and purchased a couple of email accounts for our store, the next step for our online business is to design a logo, begin drawing up the art we want to sell, find suppliers and build our store. Keep checking back or follow us on twitter @smartcookieltd to stay up to date.